DNA - Genealem's Genetic Genealogy: Southern California Genealogy Society's Jamboree 2018 - Open for Live Streaming!!! 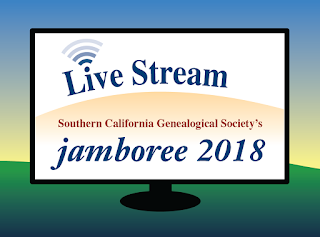 Southern California Genealogy Society's Jamboree 2018 - Open for Live Streaming!!! LIVE Streaming for Genetic Genealogy and Jamboree NOW OPEN! For the first time ever, the Jamboree Committee is opening registration for live streaming for two conferences at the same time. Ø The 6th Annual Genetic Genealogy conference is offering six classes on Thursday, May 31. Ø The 49th Annual Genealogy Jamboree is offering six classes on Friday, June 1 AND six classes on Saturday, June 2. · Handouts available to registrants for download and printing. What happened to free live streaming at Jamboree? The SCGS is very appreciative of Ancestry’s support of our conferences. Unfortunately, ever increasing costs have caught up to us and prevent us from offering this event at no charge. The Jamboree Committee has kept fees as low as possible. For members, the fee of $10 for 12 classes is just 83 cents per class. For non-members, the fee of $55 for the 12 classes is just $4.58 per class. Compared to other conference live stream offerings, SCGS remains a bargain!